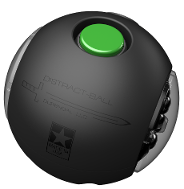 Durendal LLC presents the DISTRACT-BALL®, a state of the art distraction device that utilizes a combination of high powered CREE LED lights and intense sound to distract and confuse hostile forces. The uses for this ground breaking system are countless from combat room clearing, chemical plant protection to school and residential safety and other civilian protection. Because the DISTRACT-BALL® does not use combustion or explosive events to generate illumination and sound effects, it can be safely used in any enclosed environments to create effective distraction regardless possible presence of flammable or combustive gasses/chemicals, thus, eliminating the risks of causing damaging and costly explosions. The DISTRACT-BALL® diverts attention for few seconds in order to give YOU the distinct tactical advantage of controlling the situation and leaves opposing forces confused in its wake. The DISTRACT-BALL® has a shell made with the toughest and hardest Thermoplastic-Vulcanite available with two high impact resistant lenses and is water resistant, rechargeable and re-usable. Durendal, LLC has developed this cutting edge unit to contain 2 high powered CREE lights, each located on either side and capable of emitting up to 1040 lumens, and a speaker that emits over 110 decibels at a distance of 1 meter: the combination of high sound level and high intensity lights creates a disorienting effect aimed at distracting targeted forces in enclosed environments. Other variations of the DISTRACT-BALL® allow for constant illumination for room clearing and hands-free operations within any given situation. The DISTRACT-BALL® can also be programmed to customize the delay, start, duration and type (intermittent/strobe or continuous) of both sound and light effects to match each particular application. CREE LED lights represent a dramatic advancement in LED lighting: they are so powerful that even momentary exposure can have a dramatic impact on the human eye, leaving those exposed significantly hindered for an extended period of time, depending on the duration and level of exposure. Dimensions: 2.75 in. (70 mm) Dia. 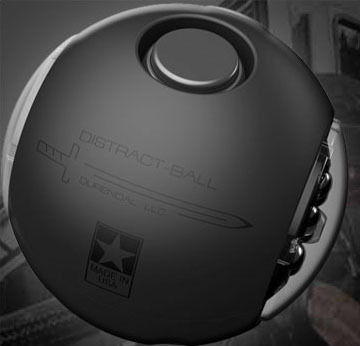 The DISTRACT-BALL IR was developed specifically keeping in mind the needs of Military and SWAT Operators to gain tactical advantage in no light situations. The Infra-Red illumination will give users with NVGs hands free optimal control and advantage in any situations where keeping the environment "DARK" is a must. The LT model has the same shell made with the toughest and hardest Thermoplastic-Vulcanite available with two high-impact resistance lenses, each housing a 990mW light, and it is water resistant, rechargeable and re-usable. The IR Model is programmed to start constant Infra-Red illumination 1.5 seconds after being armed and it will continue to illuminate the environment until turned off. The IR model can be used in NVG situations, or to covertly beacon a target for aerial surveillance. The DISTRACT-BALL LT was developed for those applications where illumination is the key factor to gain control and advantage thus allowing officers alike to reverse the fatal funnel effect and to observe opposing terrain hands free. The LT model has the same shell made with the toughest and hardest Thermoplastic-Vulcanite available with two high-impact resistance lenses, each housing a 1,040 lumens CREE LED light, and it is water resistant, rechargeable and re-usable. The DISTRACT-BALL LT is programmed to start constant illumination 1.5 seconds after being armed and it will continue to illuminate the environment until turned off.